By offering ultimate protection and improved operational effectiveness, Shark™ Ground Engaging Tools provide the first point of contact with rock – shielding your bucket in the process. Specifically designed to reduce downtime, Shark™ Ground Engaging Tools enhance the structural engineering design of OEM buckets and can considerably extend your bucket life. Benefit from lower maintenance costs while increasing the productivity of your bucket. It’s the first bite that counts. By using our SHARK™ Ground Engaging Tools, bucket life can be extended by up to 300%*, avoiding premature bucket rebuilds. SHARK™ ground engaging tools can provide cost savings up to 45% during a bucket’s total lifetime. With SHARK™ Ground Engaging Tools, we can significantly reduce maintenance downtime and extend change-out intervals. By using SHARK™ Ground Engaging Tools, the original bucket geometry can be maintained longer –maximizing each load and preventing any wear affecting optimal productivity. Without SHARK™ Ground Engaging Tools, buckets are subjected to wear-and-tear – impacting the general level of productivity with both direct and indirect maintenance costs. Ineffective buckets can influence the components and have a negative effect on fuel consumption, along with leading to additional tire wear. 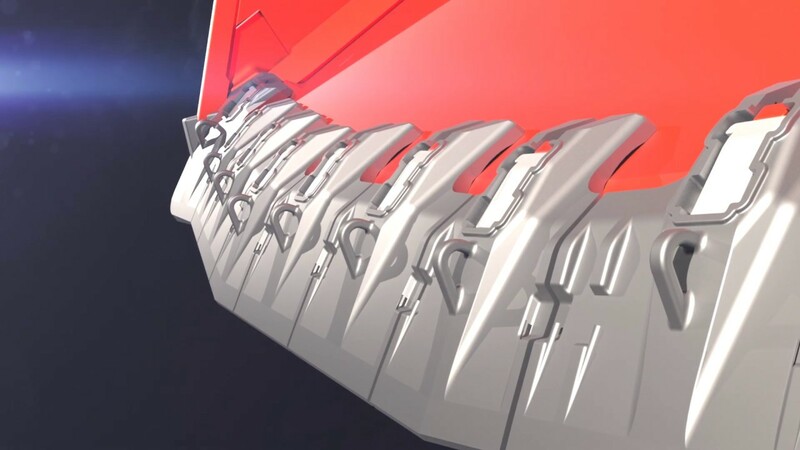 Sandvik OEM buckets and SHARK™ ground engaging tools have been developed and manufactured by our highly skilled R&D and engineering specialists. Together with our equipment design teams, they offer the best solutions for your underground operations. Made of high-quality steel and materials, Sandvik buckets and ground engaging tools are built to last. We work closely with foundries across the world to ensure castings of the highest standard. Our G.E.T. follow continuous design improvements often based directly on customer feedback, and with a dedicated engineering team focusing on implementing changes in a timely fashion. A total bucket solution has helped KGHM’s Rudna mine, Europe’s largest copper operation, reduce loader maintenance costs, optimize productivity and reduce downtime, leading to vital savings in today’s volatile commodity climate. Loaders and buckets are in a key role in improving the overall productivity of mining. In order to increase uptime and reduce the need for time-consuming repairs, the ‘arch-enemy’ of buckets – abrasion – needs to be tackled.